1. Eternal. This is my favorite! Everything about Him is without end. All the others listed below are without end. I will never come to the end of His love for me, will never come to the end of seeing all His wonder, experiencing all His faithfulness or grace, the more I see His power the more there will be to see. 2. Wonder-full. The things that make you go awe! Basically all the creatures on the EARTH movie. The worms that catch flying insects to eat. Yeah, He is full of wonders. 3. Good. He is good. All good. This is incredibly comforting. He doesn't have it out for me. His plans for me are good. He can not be anything but good. Though I don't have a proper understanding of good all the time. I can trust Him. 4. Faithful. My memory is awful, but His is not. He will never forget, He will never mess up. He will always do what He says He will do. He is worthy of trust. He will never betray me, leave or abandon me. His Word can be trusted more than anything in life. 5. His Grace is Sufficient. Oh His grace. The hope in my failures, in my weaknesses, in my mistakes. His grace will always be enough for me. 6. Powerful. Job 38-42 humbles me everytime. He is the One who commands the morning and the waves and the lightning do His bidding. And He is able to change hearts and lives like the ones below. 7. Generous. I deserve wrath, yet He gives me good. He give me every good thing I can see, feel, understand and experience. He not only Creates but lets us enjoy it. From my taste buds and each tiny seed to the atmosphere and ocean, all is His generous common grace. 8. His understanding is without end. He knows all there is to know and no matter how much I get to learn, there will always be more. So exciting! The adventure continues. 9. Loving. I love how He always unselfishly chooses to do what's in my best interest whether I deserve it or not. His love for me, and for you will never end. 10. Gentle. I love how He leads me, so gently. He doesn't me around or manipulate or get mad when i don't understand. He is gentle in His care for me, His protection and in His leadership. Join me for a link up on Sunday's (I'll put it up saturday night at 10). Awesome (truly awe-inspiring) list. I knew grace would be on there. It's a must-have (and a thankful-to-have!). I know this list could go on and on... I thought of peace-giving, as well. 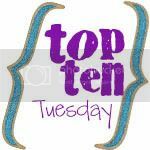 Nice Top Ten Tuesday post! What an awesome list! Our God is so wonderful, reading your list made me want to praise Him:) thanks!